7살때 나보다는 한참 성숙하게 느껴졌던 10살 오빠가 한국과 북한이 아직 휴전중이고, 언제든지 다시 전쟁이 일어날수 있으며, 서울 한복판에 사는 우리는 전쟁이 나면 죽을거라고 가르켜줬다. 그 말을 듣고 괜히 무서워져서 어린 마음에 방 구석으로 들어가 울었던 기억이 난다. 북한 수뇌부가 무언가 전하고 싶은 메시지가 있을때 하는 도발과 그에 따르는 인명 피해에는 익숙해졌지만, 1953년 이후로 최초로 북한의 리더가 남한에 와서 NSC에 참석하느라 새벽잠을 설치셨겠다고 하는 김정은의 농담은 낯설다. 두 나라가 서로의 존재를 인정하고 협력해서 한반도의 비핵화를 이끌어내고 경제적으로 협력하면 참 좋겠으면서도 27년동안 못본 일을 보니까 어떻게 받아 드려야 하는지 잘 모르겠다. 조심스러우면서도 왠지 기대가 되서 미국시간으로 새벽 5시에 일어나서 남북공동선언문의 생방송을 봤다. 그리고 남북이 새로운 협력의 국면에 이르렀을 수도 있다라는 생각이 들었다. ‘분단선이 높지도 않은데 많은 사람들이 밟고 지나다 보면 없어지지 않겠냐는’ 김정은의 말에 희망이 조금 생겼다. 실향민들, 탈북자들과 이산가족분들이 세상을 떠나기 전에 자신의 가족을 볼 수 있다면. 5000년의 역사를 나눠서 통역이 필요없는 남과 북이 1945년에 미국 군인들이 임시로 그은 선이 국경이 되서 75년째 싸우고 있는데 자주적으로 평화를 이룰 수 있다면. 남북이 통일을 하면 한국으로 돌아가 북측의 경제발전을 돕겠다고 뜬구름을 잡았던 내가 어떤 일을 하면 도움이 될 수 있을까 구체적으로 고민하게 됐다. 돌아갈 이유가 생겼으면 좋겠다, 간절히. I was 7 years old when my then 10-year-old brother told me that South Korea and North Korea were still technically at war. He also reminded me that we’d probably die instantly if a war were to break out since we live in Seoul. I put on a tough face but ended up hiding in the corner of my room and crying out of fear. After 27 years of witnessing North Korea sending their ‘messages’ through military aggression, I’ve gotten used to it. But it’s quite something to see North Korea’s leader set foot into South Korea for the first time since 1953 and joke about South Korea’s president having to wake up early to attend National Security Council meetings with the United States because of their nuclear weapon. I feel cautiously optimistic, but the past 27 years tell me that I should manage my expectations. This Friday, I woke up at 5am to watch President Moon and Kim Jong Un give a speech about their commitment to end the war and denuclearize the Korean peninsula. When Kim Jong Un said that ‘the 38th parallel may disappear if enough people step over it’, it gave me hope. There are still Koreans who are dreaming about the day they’d meet their families left in North and South before taking their last breath. President Moon and Kim Jong Un didn’t need a translator because South Korea and North Korea share 5000 years of history together. I’ve mentioned in passing that I will go back to Korea to help rebuild North Korea’s economy if two Koreas reunite, and it doesn’t feel too crazy of a project now. I pray that there will be plenty of reasons for me to go back. 박영선 의원이 나온 ‘어쩌다 어른’이라는 예능 프로를 보다가 엉엉 울었다. 박영선 의원의 남편이 일본으로 해외파견을 가게 되서 9살짜리 아들을 같이 보냈는데 아들이 전화해서 “엄마 외로울 때는 어떻게 해?”라고 물어봤다는 대목에서 였다. 강하게 키워야 한다는 생각으로 외로우면 책을 읽으라고 하고 말하고 끊으셨다는데, 정작 20년이 가까이 된 이야기를 하면서 박영선 의원의 눈시울은 붉어졌다. 나도 어렸을때 엄마가 바쁘셔서 할머니와 작은엄마댁에서 컸다. 초등학교 3학년때 엄마에게 “엄마는 나 낳아놓고 언제 키울라고 그래. 어렸을때는 할머니가 키우고, 왜 나이가 드니까 작은엄마한테 맡겨”라고 말한 전과가 있어서 큰 공감이 됐다. 그 9살짜리 꼬마가 말한 외로움. 어렸을 때 느낀 외로움은 맞벌이를 하셔서 바쁘셨던 엄마에 대한 그리움과 겹친다. 초등학교때 비오는 날 우산을 안가지고 와서 쫄딱 비를 맞고 집에 왔을때나, 백일장에서 상 받는날 쏜살같이 집으로 달려왔는데 문을 열어도 온통 냉기만 있을 때 말이다. 아이러니하게도 어렸을때부터 부모님과 떨어지는 훈련이 되서인지 중학교 1학년때는 캐나다로 유학가는 오빠를 따라가겠다고 졸라서 떠났고, 나라를 여섯번 바꾸면서도 한국으로 돌아오겠다고 짐싸지 않고 14년을 지냈다. 한국에 있을때는 수학시험에서 14점을 받아서 가족에게 놀림과 눈치를 받으면서 다시 책상에 앉았는데, 집을 떠나서는 힘들게 유학을 보내주신 부모님께 좋은 소식만 전하려고 이를 악물고 공부했다. 한국에서 특별히 공부를 잘하지 않았고, 영어도 못하는 채로 8학년에 유학을 시작했는데 대학 진학 목표는 커서 스케줄러에 따라잡아야 하는 것을 빽빽히 적으면서 외로움이 틈 탈 기회를 안줬다. 그런데 성인이 되면서 오는 외로움은 조금 더 복잡하고 위험하다. 대학교 4학년때 걱정이 많았다. 취직을 하려고 샌프란시스코에 왔는데 90일안에 직업을 구하지 않으면 F1 비자가 만기가 되서 한국으로 돌아가야하는 상황이였다. 심장이 너무 두근거려서 자다가도 벌떡 일어나서 맥박을 쟀고, 카페에 앉아 있어도 누군가 나를 공격할 것 같아서 등을 벽을 대고 앉아 있어야 했다. 심할 때는 숨을 쉴수도 걸을 수도 없어서 벤치에 앉아서 쉬었다. 한참 지나서 내 증상이 공황장애 초기 증상이라는 것을 알게 됬는데 우울증은 죽고 싶은 것이고 공황장애는 죽을 것 같은 것다는 말은 맞는 말이다. 2015년 여름, 인터뷰를 결과를 초조하게 기다리면서 엄마랑 통화할때 늘상 그랬던 것 처럼 안심시켜드리려고 계속 괜찮다고 했는데 엄마가 말씀하셨다. ‘딸아, 계속 괜찮다, 괜찮다 하는거보니까 사실 너 안괜찮구나. 안 괜찮을때는 안 괜찮다고 해도 되’. ‘아, 힘들 때는 힘들다고 해도 되는 구나’. 중학교 1학년때 집을 떠난 이후로 뭐든 혼자 해결해야 한다고 생각했던 내게 엄마의 말씀이 너무 큰 위로가 됐다. 박영선 의원이 20년 후에도 울먹이며 아들의 이야기를 하시는 것처럼 울 엄마도 내가 한 투정이 못내 미안하셨겠구나. 엄마도 삶을 사시면서 안 괜찮으실 때가 셀수 없이 많으셨을텐데 내가 엄마가 힘드실때 위로가 되는 딸이였는지 생각해보면 분발해야 겠다. 외로움은 내게 특별한 의미가 있다. 외로움은 답을 줬다. 뭘 해야할 지는 알려주지 않았지만 무언가는 해야한다는 답을 말이다. The loneliness that this 9-year old asked about is similar to the loneliness I felt when I raced back home to share a little prize I won for writing only to find that there is no one at home. As a working mom, she has always been and is busier than me. Ironically, I jumped on the opportunity to study abroad in Canada with my brother when I was 13 because I knew that I could more or less take care of myself. Except for the first few seasons, I thoroughly enjoyed living in 6 countries in the past 14 years and didn’t pack my bag and return to Seoul like most of my friends who studied abroad did. I barely spoke English when I started school in Canada as a 8th grader, and didn’t have time to miss home if I were to get into the college of my choice which seemed like an unattainable dream. Being able to share how I was truly feeling was a consolation. Ever since I left my family to study abroad when I was 13, I was under the impression that I had to figure out everything on my own. Good news were easy to share, but I wanted to lie than to share bad news. Watching the interview clip of Congresswoman Park Young-sun, it dawned on me that my mom might have also teared up when I asked her when she was going to raise me – I might have been just too young to realize it. The feeling of loneliness doesn’t tell me what to do, but it does tell me that something needs to be done. That could be its purpose. 배움이 이렇게 즐거우면 평생 공부하고 글만 쓰고 살아도 좋겠다고 생각한 적이 있다. 일본에서 고등학교를 다닐때 Isomura선생님께서 인류학에 관심이 있는 내게 소개해주신 North Koreans In Japan: Language, Ideology, And Identity (Ryang, 1997)이라는 책을 읽고 나서이다. 이 책은 2, 3, 심지어는 4대째 일본에서 살면서 당시에 생긴지 얼마 안된 북한이라는 나라에 소속하기로 선택한 재일 조선인의 정체성에 대해 연구한 책이다. 재일 조선인에 대해 관심있는 사람은 이 다큐멘터리를 보는 것을 추천한다. 한국이 경제발전을 이룬 후인 21세기에 동경에서 국제학교를 다닌 나는 별다른 차별을 받지 않았다. 우선 눈에 뛰지 않았다. 굳이 입을 열어 어눌한 일어를 하지 않으면 하얀 셔츠에 회색 교복 치마를 입은 흔한 고등학생으로 동경 지옥철에 실려 날리는 2000만명의 사람 중 한명이였다. 학교 안에서는 선생님도 친구들도 대부분 외국인이라 튈 일이 없었다. 그런 내가 아무렇지도 않게 한국식 치킨을 먹으러 갔던 신오쿠보와 그럴때 마다 스쳐지나갔던 역 앞에 있는 파칭코가 재일교포들이 차별을 받으면서 몇 배 더 노력해서 극복한 삶의 터전이었겠다고 생각하니 마음이 아리다. 타지에서 받는 차별이 가장 힘들때는 치사해도 떠날 수 없을 때이다. 휴학하고 파리에서 살때 인종차별을 밥먹듯이 받고 거울을 봤는데 아시아 여자가 서있는 것을 보았다. 거울을 볼땐 나는 항상 나를 봤는데, 어딜 가도 눈에 뛰고 중국어나 일본어로 인사를 받으니까 내 이마에 라벨이 붙은 것 같았다. 그래도 마음이 크게 힘들지 않았던 것은 공항에서 신발에 먼지를 털면서 다시 돌아오지 않겠다고 하고 떠날 수 있어서이다. ‘어차피 파리 너 더럽고 느리고 별로 내 스타일 아니거든!’ 하면서. 근데 생계 때문에, 다른 방법이 없기 때문에 속하지도 못하고 떠나지도 못하는 이민자의 삶은 몇 배나 더 힘들다. 평생 그 나라에서 나고 자랐는데도 ‘어디에서 왔냐?’라는 말을 들으면 좌절하는 2세들처럼. 방에서 하루를 꼴딱 걸려 Pachinko를 읽고 부은 눈을 하고 거실로 나왔더니 룸메이트가 책이 해피엔딩이냐고 물어봤다. 쉽게 대답을 할 수가 없었다. 순탄한 인생이 해피엔딩이라면 결코 해피엔딩이 아니지만 삶이 준 여러가지 난제 속에서도 포기하지 않고 버텨서 타지에서 정착해서 후대가 나보다 더 낫게 살게한 것은 사랑이 없으면 할 수 없는 일이기 때문이다. 2년동안 자백하지 않고 고문을 이긴 용감한 Isak이 폐렴에 걸려 피를 토하면서도 아들을 위로를 해준 것이 그 증거이다. 힘든 와중에도 사랑하는 사람에게 위로가 되줄 수 있는 희생이 행복의 씨앗정도는 되지 않을까. In 11th grade, I had a lightbulb moment and thought that it would make me immensely happy to become an academic and write for the rest of my life. As with most of my stories, it started with a good book. I went to a small international school in Tokyo for the IB Diploma Program, and was fortunate to learn from some of the best teachers in my life. Knowing my interests in anthropology, Ms. Isomura told me to check out a book called North Koreans In Japan: Language, Ideology, And Identity (Ryang, 1997). This book checked all my boxes as it explores the identity of Japan-born Koreans who associate themselves with North Korea even after living in Japan for generations. If you are interested, you can check out the VICE’s documentary here. It’s almost been 10 years since I researched about that topic, and I’ve since moved on. Or so I thought until I stumbled upon a historical novel called Pachinko which follows a Korean couple who migrate to Japan during 1920s. There were so many cultural references I could relate to as I lived in Japan as Korean, yet I was grateful that I didn’t know anything about the hardships that these characters faced settling down in Japan as foreigners. One moment that struck me was when a dying father – Isak – consoles his son before taking his last breath. “You are very brave, Noa. Much, much braver than me. Living every day in the presence of those who refuse to acknowledge your humanity takes great courage.” Isak was tortured by the Japanese police for 2 years because he refused to bow and pay respects to the Emperor of Japan. He was a pastor, and his religious belief didn’t allow him to do that. Isak also knew that Noa had to sit at the very back of the classroom because his teacher thought that he smelled of garlic and pig’s feces. It wasn’t that Isak lacked bravery compared to his son, but he chose to offer words of empowerment to his son as a parting gift because he knew that Noa will have to weather a lifetime of racism. Discrimination is particularly difficult to swallow when there is no way out. The first time I saw myself as an Asian was when I lived in France for a year. When I stayed in a commune in the outskirts of Paris called Rambouillet, I could feel people’s curious eyes following me as I walked around town to get some croissants or crepes. A waiter at a restaurant that I was a customer to asked me for my number because he wanted to have my number handy in case he needed a massage, and a pizzeria owner reminded me to not drink the chili oil he placed on my table. In just a few months, I saw an Asian girl when I looked at myself in the mirror. I was comfortable in my own skin for 21 years, and it took me 4 months to feel somewhat different. Though I must say, I don’t pretend to know how it feels to answer questions like ‘where are you from?’ when that place is indeed home. It’s a different ball game to be treated as a foreigner at home. I raved about Pachinko to my roommate Elen, and she asked me if this book had a happy ending. It’s hard to say. If you associate happiness with a comfortable life, then most definitely not. But there’s something to be said about persevering through all of the lemons that this life throws at us and paving a way for our next generation whether in the form of better financial circumstances or words of empowerment. That sounds like a foundation for a happy life to me. 최근에 판사유감과 검사내전이라는 책을 읽었다. 이 두 책은 개인주의자 판사와 생활형 검사가 법조인으로써 20년 가까이 살며 겪은 경험담을 쓴 자전적 에세이이다. 이 책을 읽고 느낀 점은 평범한 시민인 내가 보기에는 기득권이 있는 집단의 일원도 본인이 세상을 바꿀 수 있다는 확신에 가득차 있지 않다는 것이다. 김웅 검사는 검사가 실세인 것 같지만 결국 판단은 판사가 하기 때문에 판사도 임명보다는 국민이 투표해야 해야한다고 제안했고, 문유석 판사는 업무에 치여서 세상을 조금이라도 더 낫게 바꾸기 위해 헌신하며 살고자 하는 마음은 감기처럼 가끔 앓는 일이라고 했다. 대통령쯤 되면 세상을 바꿀 수 있을 것 같지만 여당과 야당 사이의 줄다리기를 잘하지 못하면 공략을 포기해야하고, 다수는 안타깝게도 결국 검사에게 잡혀 판사 앞에 서게 된다. 세상을 바꾸자는 말은 여의도나 실리콘밸리에서 참 많이 들리는 말인데, 단순히 어떤 감투를 가지고 있어서 변화를 만들수 있는 것은 아닌 것 같다. 대학교 4학년때 싱가포르의 국부펀드 GIC와 면접을 봤다. GIC는 약 359조원의 자산을 운용한다고 예측됬고 신입사원을 위한 8달간의 로테이션 프로그램이 있어서 와튼을 졸업 한 새내기에게 욕심이 나는 기회였다. 마지막 인터뷰는 투자은행과 IMF에서 10년씩 경험을 쌓고 국부펀드로 이직한 임원과 했는데, 새로 사서 깃이 잔뜩 선 양복을 입고 금융에 대한 나의 열정을 어필하고자 진부하게 Intelligent Investor를 읽었다는 나에게 세상을 바꿀 수 있다고 생각하냐고 물어보셨다. 예비 신입사원의 포부를 보여드리고자 세상을 바꿀 수 있다고 자신있게 말했는데, 그 분은 사회초년생으로서는 세상을 바꾸기 보다는 내가 고르는 세상이 나를 바꿀 거라고 했다. 그리고 인터뷰중 내가 한 말중에 가장 확신이 있어 보인 이야기는 아프리카에서 소액금융으로 마을을 개선한 이야기라며, 그런 일에 관심이 있으면 이 회사는 맞지 않을 것이라고 했다. 자기도 국제기구에서 일을 하다가 금융계로 옮겼는데 올바른 선택이였는지 아직도 모르겠다면서 본인의 적성에 맞는 길을 선택하기 바란다고 하셨다. 하루종일 면접을 하고 난 뒤 타임스퀘어의 호텔로 돌아가는 길에 전화로 불합격 통지를 받았다. 당시에는 마냥 아쉬웠는데, 그 인터뷰를 마지막으로 내가 정말 관심이 있는 일을 해야겠다고 결심했고 졸업 후 실리콘벨리로 가는 편도비행기를 끊었다. 70개 넘는 테크회사에 지원을 한 뒤 우버에 입사했는데 미국에서 1년 일한뒤 싱가포르 지사로 가게 되었다. 운명의 장난처럼 Tanjong Pagar에 있는 우버 건물 바로 앞에 GIC 건물이 있었는데 감회가 남달랐다. 그때 GIC가 됐어도, 안됐어도 결국은 이 신호등을 기다리고 출근을 했겠구나 싶어서. 그리고 다른 마음을 가지고 정반대의 일을 했겠구나 생각이 들어서. 뒤늦게 내가 고른 세상이 날 바꿀 거라는 그 분의 말이 틀리지 않았다는 것을 느꼈다. 나 혼자 열정을 불태워서 세상을 바꿀 수 있을 것 같다는 확신은 매해 조금씩 줄어든다. 하지만 내 크고 작은 선택이 나를 바꾼다는 것은 확신하고, 결국은 이런 개개인의 선택이 모여서 사회가 변화한다는 것을 믿는다. 그리고 오히려 이 작은 믿음이 하루 하루를 더 열심히 살아가게 한다. 일단 내가 바뀌어야 무슨 일이든 할 수 있고, 내가 바뀌는 일도 충분히 어렵기 때문에. 앞으로 어떤 선택을 하게 될지 기대된다. I recently came across two interesting memoirs written by a Korean prosecutor named Kim Woong and a judge named Moon Yoo Suk. They each had two decades of experience in their fields, and recounted countless episodes of struggling to make a dent in this society by handling each lawsuit – small or big – justly. One thing that struck me though is that they didn’t seem so convinced that they can change the world for the better even after spending two decades in the public office. Prosecutor Kim said that prosecutors’ impact is limited as judges ultimately call the shots, and Judge Moon said that the thought of making this world a better place crosses his mind a few times a year like a flu because he’s inundated with so much work. Growing up, I naively dreamed of running for office so that I can bring all these perfect policies to life. After seeing so many presidents I voted for stand in front of a judge after being investigated by prosecutors, I’m not so convinced that holding an office will grant me a spot as a change agent. During senior year of college, I interviewed for the GIC Professionals Programme. GIC is Singapore’s sovereign wealth fund estimated to hold US $359 billion in asset, and I was completely sold on their 8 months rotations program. It seemed like a perfect path to take after graduating from Wharton. My superday interview with GIC was a series of 5 back-to-back interviews at their New York Office, and my last interview was with an executive who had spent a decade in IMF and investment banking before joining GIC. Towards the end of the interview, he asked whether I thought I could change the world. Being a natural idealist, it wasn’t difficult for me to respond yes but he thought differently. He said that the world I choose as a new grad will change me, and that the most convincing thing I said during this interview was bringing microfinance to Africa which makes him doubt whether GIC was the right fit for me. He said that he too had to ask himself similar questions when he transitioned from IMF to investment banking, and that I should choose a career path that I was truly excited about. On my way back to the hotel in Time Square, I got a phone call from the recruiter saying that I won’t be proceding to the next round. That phone call sucked all energy out of me, but it also pushed me to book a one-way flight to San Francisco after graduation to look for jobs in tech. I’ve always wanted to be an entrepreneur, and I wanted to go to a place where I can learn from the best. I joined Uber that summer after much searching, and it’s been a ride since. Ironically, I spent one year in Uber’s APAC headquarters in Singapore and GIC’s office was right across the street from my office. What dawned on me was that I would have still stood in this same traffic light on my commute to work regardless of whether I made that interview or not. It’s just that the industry I chose gave me experiences that are night and day from finance. He was spot on that the world I chose changed me, because I cannot imagine where I would be now had I not took that flight to San Francisco summer of 2015. My baseless optimism that I can change the world is waning. But I’ve come to realize that the choices I make every day transforms me, and that these choices in aggregate can change the society. Ironically, this belief motivates me even more to live each day with purpose because changing myself is a challenge on its own. Here’s to all the choices you and I will make. 참 아이러니하게도. 원래는 고민이 있으면 토해내듯이 지극히 감성적이고 두서없는 글을 썼는데 이제는 글을 쓸만한 ‘건수’가 생기면 생각이 꼬리에 꼬리를 물다가 결국은 아무것도 안쓴다. 이왕 글을 쓸꺼면 도메인도 샀는데 블로그에 올릴 수 있는 글을 써야 하지 않을까 생각하다가, 사실 내가 가지고 있는 많은 생각들은 불특정한 다수와 나누기에는 발달이 되지 않았거나 너무 솔직해서 나중에 이불을 발로 걷어찰 바에는 아예 안쓰는게 낫다고 포기한다. 나중에 글로 먹고 살고 싶다는 말이 무색하게 게으른 점과 잠수 타는 것을 좋아하는 것도 한 몫 한다. 하지만 아침에 일어나는 것이 즐거웠으면 좋겠고 퇴근 후 집으로 오는 발걸음이 가벼웠으면 좋겠는데, 그러려면 나의 가장 이루어 지지 않을 것 같은 꿈 – 일 년에 한달은 하코네에 혼자서 가서 글을 쓰고 돌아오는 것 – 을 매일 작은 행동으로 도전하고 싶다. 올 해 개인적인 목표가 홀로 설 수 있게 사이드 프로젝트를 하는 것과 만명이 방문하는 블로그를 만드는 것인데 전자가 어려움에 봉착해서 후자를 개시하는 것도 있다. 적어도 앉아서 글을 쓰는 것은 내 뜻대로 할 수 있으니까. 직장인 3년차에 작은 팀을 꾸리며 후배들에게 ‘안되면 되게하라’라고 나무라다가 회사 일을 하듯이 사활을 걸고 내 개인적인 프로젝트를 추진하면 하늘에 있는 별이라도 따올 수 있을 것 같다는 확신이 생겼다. 그때 내가 간과한것은 출근 전 두시간과 퇴근 후 두시간을 매달리게 하는 보람이 있고 즐거운 일을 찾는 것과, 매일 같이 그 열정의 불이 꺼지지 않게 하는 것이 어렵다는 것이다. 언제는 쉬워서 했나 – 지금이 가장 시간적으로 여유로울 때니 한번 해보자. I stopped writing altogether after I started this blog. It’s quite ironic. My prized method of destressing has always been writing. I would pour my heart out on a journal every time I was happy, sad or upset since I was little. I have two bookshelves full of journals I need to burn before I leave this Earth – there’s some really embarrassing stuff in there that no one should read. Writing has been my best friend through thick and thin. But when I feel the urge to write these days, a blog fairy taps me on my shoulder and says ‘You paid for this pretentious domain – soominhwang.com. I think you should write something that you can publish it.’ And that somehow kills the mood. Everything that is worth writing is too private for me to share. Or so I think. My crazy dream is going on a solo writer’s retreat to Hakone one month a year, and I cannot justify that trip if I’m not working towards it everyday one way or another. Let’s see if I like this writing thing enough to jump out of bed in the morning and rewrite to my heart’s content in the evening. 올 여름, 인터넷을 고치는 기사님이 집에 오셔서 새로 설치한 기계를 설명 해야한다며 딸을 불러달라고 하셨다. 마침 오랜만에 한국에 한달 가까이 있을때라 충분히 내가 숙지해서 가르켜 드릴 수 있었는데 엄마께서 “저한테 가르쳐 주세요. 딸은 한국에 잘 없어요” 라고 하셨다. 내가 어린 나이에 집을 떠나 혼자 해결해야 했던 일이 많았던 것처럼 엄마도 딸에게 의지 하고 싶으셨을 때 내가 없었겠구나 하는 생각에 죄송했다. 하루 하루 잘 버텨내다가도 부모님의 30주년 결혼기념일을 직접 축하해 드리지 못할 때, 조카의 돌에 고모가 빠질 때, 언니가 몸이 피곤할 때 힘이 될수 없고, 오빠와 미주알 고주알 수다를 떨지 못할때 가슴이 먹먹해온다. 외국에서 산 기간이 한국에서 큰 기간보다 길어졌는데도 가족이 있는 곳이 고향인가 보다. 2004년 여름 밴쿠버에서 유학을 시작했는데 방학 때만 갈 수 있고, 놀고 쉬러 가는 한국은 나를 들뜨게 했다. 한국에서는 돌아다니느라고 바빠서 못 보는 드라마도 금요일이면 한국 비디오가게에서 빌려 봤고, 서울이면 귀가 독촉으로 느껴지는 부모님과의 통화도 목 빼고 기다리게 했다. 그리웠던 친구들에게 편지라도 오면 눈물을 글썽였고, 수영장에 입장 벨소리가 한국 핸드폰 문자 알림 소리라서 한참을 서서 감상에 젖은 적도 있다. 인천행 비행기를 끊은 뒤에는 노트 가득 볼 친구, 먹어야 할 음식, 사야 할 물건을 빽빽이 적고 갔고, 다시 돌아오면 25키로 캐리어 두개 가득 반찬과 문구용품을 챙겨왔는데도 그렇게 허전했다. 좋은 것만 기억하고 그리워하는 ‘선택적 향수병’을 가지고 십여년간 외국생활을 한 내가 안쓰러웠는데 감정이 메마른 지금 돌아보면 소풍가기 전날처럼 무언가에 대해 조건 없이 설렌다는 것은 감사한 일이다. 외국 생활도 어연 14년차, 한국에 대한 무조건적인 동경은 조금 시들해졌고 내가 한국인이라고 느끼는 것 만큼 한국을 모른다는 것을 알게 됬다. 입시, 취직, 사회생활 등 또래 친구들이 겪는 일상을 티비로 배우고 있어서 서울을 오랜만에 갈때는 카페 옆에서 타블로가 노트를 끄적이고 있고, 감기가 들어 동네 병원에 가면 송혜교가 진료를 볼 것 같다. 최근 들어서야 Ridibooks를 통해서 한국책을 읽게 됬는데 띄어쓰기와 맞춤법도 헷갈려서 글을 쓰려면 네이버로 몇 번을 확인해야 하고, 그래도 틀린다. 그리고 무엇보다 산전수전 공중전을 겪고 기어이 미국으로 돌아와 일을 하고 있는 지금은 한국이 마냥 좋았더라면 돌아갈 기회가 여러번 있었다는 것을 안다. 이것 저것 재봤을때 미국에서 일하고 사는 것이 만족스러워서 정착을 준비하고 있다. 하지만 하코네로 온천하러 가는 것보다 한국을 가는 비행기 안이 더 설레고, 인천공항의 출입국 관리소를 지나 짐찾으러 내려가는 에스켈레이터 맞은 편에 있는 분수가 꿈에도 나타나는 것을 보면 14년차 ‘선택적 향수병’이 고향이 되버린 서울을 집으로 바꿀 수도 있겠다. 내 일과 삶에 서울이 차지하는 비중이 커지도록 열심히 살아야 겠다. An internet technician came by my parents’ place in Seoul this summer and asked me to come and learn how to operate the new router he had just installed. It was a fairly new model, and he wanted me to learn it so that I can help troubleshoot if we have problems with internet again. My mom interrupted and told him to teach her instead as I’m not around anyway. Having left home to study abroad when I was 13, I had assumed that I was the one who had to learn to take care of myself; I learned this summer that my parents probably had to do the same and will feel increasingly more so as years go by. I left Seoul in the summer of 2004 to study abroad in Vancouver. What was supposed to be a short few years in Canada to learn English turned into a 14 year long journey of living in Canada, China, Japan, France, Singapore and the United States. Some seasons were tougher than others, but it’s a blessing to have lived life as a nomad in my teens and twenties – I don’t know who I’d be now had I not met the people that shaped me and lived in the places that guided me to where I am today. As an added bonus, I’ve dreamt of living in San Francisco and working at a company since my junior year of college, and my commute each morning reminds me that there’s no city I’d rather be. First thing I did when I visited Chicago a few months back was visiting the Art Institute of Chicago. All the rave reviews didn’t disappoint and I absolutely loved how extensive their collection was – in fact, the Art Institute is now my favorite art museum in the US. One of the pieces that stood out to me was Self-portrait by Van Gogh (1887) – Van Gogh was a post-Impressionist era painter who created over 2000 artworks in just a decade. I can barely get myself to write a blog post every week so I cannot imagine how serious he was about his craft to complete that many works. 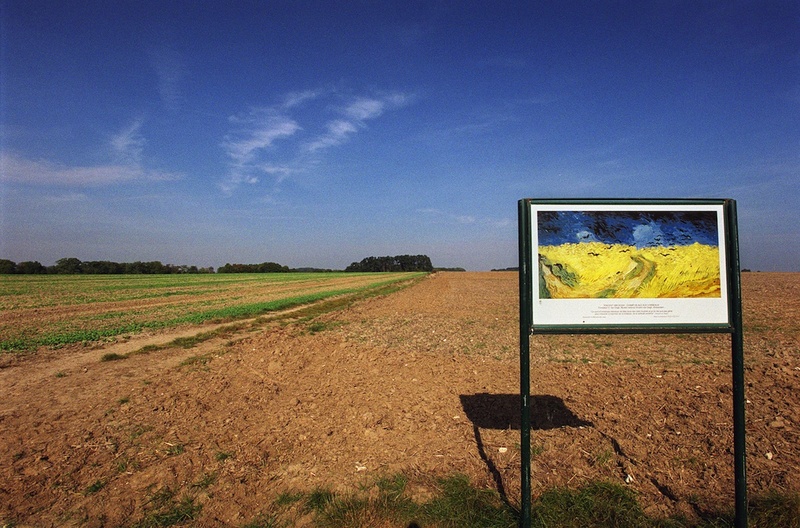 Visiting Auvers-sur-Oise a few years back convinced me that he was a genius because all I saw was a wheatfield and he saw something quite different. I had the privilege of visiting the Van Gogh Museum in Amsterdam when I studied abroad in Paris, but taking a walk through 10 years of his works had me see him as a lonely soul just as much as an artist. Not because he lived in poverty all his life, but because he bought an extra bed in hopes of creating an artist’s collective but couldn’t find an even-tempered artist who could bear his eccentric personality. Even if Van Gogh was appreciated during his lifetime, I don’t know if it would have been enough to fill the void in his heart. This might not be the most obvious comparison, but I see a great deal of Van Gogh in Tablo. Epic High’s new album came out recently so I’ve been listening to them non-stop, and I still find Tablo’s lyrics brutally and beautifully hard-hitting. Also, Van Gogh is great and all but I can definitely relate to Tablo more than any other Korean artist. Tablo also lived in different countries growing up, found it hard to belong to a particular community, and loved writing as a result. He graduated from Stanford in 2002, so I would likely not have been able to enjoy his music had he decided to join Google as a Product Marketing Manager. Who knows – he might have gotten a fair share of Google’s equity and could have gone back to writing songs afterward. And sadly so, that might have helped him avoid a crazy scandal and protect his family from a painful time that they didn’t deserve. There are many references to death in Tablo’s songs, and I really hope that he will get to enjoy the blissful pieces of life at his peak. I admire the people who do their own thing and who can express what so many people feel but cannot articulate. Also, there’s something enticing about having control over one’s own time even if it means working many times harder. I want to take baby steps that will get me there in the future – I’m no painter nor a rapper, but I still am an artist of my own life after all. *If you want to check out Tablo’s songs, this could be a good one to start. 시카고를 처음 간 날 부푼 마음을 안고 Art Institute of Chicago에 갔다. 좋아하는 화가들의 작품을 봐서 기뻤는데 반고흐의 자화상에서 발걸음이 멈췄다. 반고흐는 나이 27살에 그림을 그리기 시작해서 10년동안 유채화만 860여장을 그린 정말 부지런한 화가이다. 나는 일주일에 글 하나 올리는 것도 힘이 드는데 4일에 하나씩 작품을 완성한 격이다. 처음 반고흐의 예술성을 느낀 것은 파리 근교의 Auvers-sur-Oise에 갔을때 이다. 사진에 필터를 잔뜩 넣고 앵글에 아무리 힘을 줘도 그냥 들판인데, 자기만의 방법으로 표현해서 Wheatfield with Crow라는 그림이 나왔다는게 놀라웠다. 쉬지 않고 그림을 그린 사람이라서 암스테르담의 반고흐 미술관에는 그 사람의 10년 화가 인생이 그대로 담겨있는데 문뜩 연민이 생겼다. 살아있을 때 그림을 한 장 밖에 팔지 못하고 평생 가난하게 살아서가 아니라, Alres에서 마음이 맞는 다른 화가들과 함께 살려고 침대도 두개 샀는데, 괴팍한 성격과 잘못된 만남으로 외롭게 생을 마감했기 때문이다. 그가 사후 누리고 있는 영광이 살아 생전에 왔더라도 우울증을 극복하게 해줬을까 하는 의문이 든다. 말도 안되는 비교일수도 있지만 내게 현대판 반고흐는 타블로다. 요즘 에픽하이의 새 앨범이 나와서 전곡을 반복해서 듣고 있는데 가사들이 여전히 날카롭게 파고든다. 그리고 19세기에 태어난 네덜란드인보다 타블로가 더 친근하게 느껴진다. 타블로도 이 나라 저 나라 돌아다니면서 생활했고, 크면서 어디에도 속하지 못하는 외로움을 느꼈고, 글을 쓰는 것을 좋아해서 그러나 보다. 실리콘밸리의 중심인 스탠포드대학를 나온 타블로가 17살부터 작사가로 활동하는 대신에 구글에서 Marketing을 했다면 지금 내가 이토록 좋아하는 노래들이 없었을 수도 있다. 하지만 사람일은 모르는 것이니까 구글 초창기 멤버로 돈을 잔뜩 벌어서 은퇴 후 취미로 노래를 만들고 있을 수도 있겠다. 그리고 그랬더라면 타진요같은 말도 안되는 해프닝때문에 가족이 고통을 받는 일을 피할 수도 있었을지 모르겠다. 타블로가 쓴 많은 노래 가사에는 죽음에 대한 고뇌가 느껴지는데, 반고흐와는 다르게 인생의 아름다움을 전성기에 느끼기를 응원한다. 나는 자신의 일을 하는 사람과, 모두가 느끼지만 쉽게 표현할 수 없는 감정을 쓰는 사람을 동경한다. 10대 때는 막연하게 좋은 대학을 가면 뭔가 멋지고 특별한 인생이 펼쳐질 것이라고 생각했는데, 직장생활을 하다 보니 큰 성공은 제쳐두더라도 내 시간에 대한 결정권을 가지는 것이 얼마나 소중한지 느끼고 있다. ‘자유’와 그에 따르는 책임을 질 수 있게 준비해야겠다.